In 2016, RKK Energia of Korolev, Russia, entered negotiations with KB Yuzhnoe of Dnepropetrovsk, Ukraine, on a potential deal to launch a satellite for Angola on a Ukrainian-built Zenit rocket. Under the proposed plan, the Angosat-1 satellite would ride the last fully assembled Zenit rocket still remaining in Baikonur. The mission is seen by industry insiders as the first step in the resumption of Zenit missions, which if successful, will eventually shift from Baikonur to the Sea Launch ocean-going platform based in Long Beach, California. Zenit rocket with the Angosat-1 satellite is erected on its launch pad on Dec. 24, 2017. In September, RKK Energia struck a deal with the Russian airline group S7 to bankroll the revival of the Sea Launch venture, which remains mothballed in the wake of severe financial problems and the political fallout from the Russian-Ukrainian conflict of 2014. However even with the new investments, it would take at least 18 months to get all the necessary approvals for the reactivation of the Sea Launch vessels in California. In the meantime, RKK Energia was completing the development of the Angosat-1 satellite under a commercial agreement with the government of Angola. 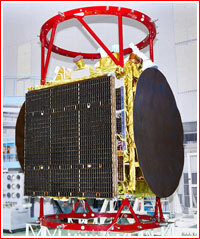 The spacecraft, which was based on the company's Yamal platform, was then expected to be ready for launch in July 2017. 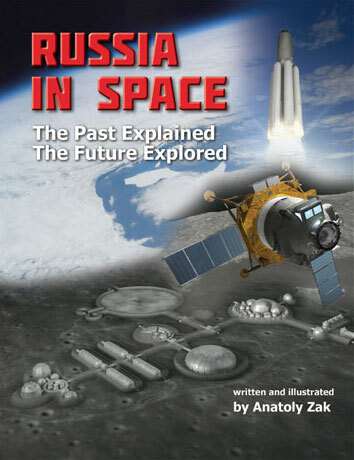 It was originally designed to be delivered into orbit via Sea Launch, but after the financial collapse of the venture, RKK Energia considered switching the mission to the second test launch of the Angara-5 rocket. However, after endless delays with the introduction the Angara's new production line in Siberia and with the new hope to revive the Sea Launch, RKK Energia revisited the Zenit option. One caveat with the proposed plan is that the Zenit rocket currently stored at Site 42 in Baikonur was originally procured by the Russian space agency, Roskosmos, for the launch of the Spektr-RG astrophysics satellite. However, in an interview with the Izvestiya daily published on Oct. 20, 2016, Sergei Lemeshevsky, the head of NPO Lavochkin, which develops Spektr-RG, said that the company had considered switching the mission from Zenit to the Proton-M/Block DM launcher. Adapting the Spektr-RG to a new booster could delay the mission by at least nine months, however, some industry sources see the move as a smoke screen for possible technical problems with the Spektr-RG itself, which would push back the launch anyway leaving already purchased rocket without any job in the near future. In the meantime, the Zenit rocket in Baikonur has already overstayed its operational warranty and will require refurbishment by a Ukrainian team before it can be used one way or another. 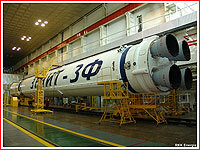 With the proposed plan to re-configure the rocket for the launch of Angosat-1, it is still unclear how long it would take for KB Yuzhnoe to re-certify this Zenit for launch. However, immediately after the signing of the deal between RKK Energia and S7 in September, Ukrainian space officials said that they would be open to cooperation with the Russians on the Sea Launch venture. In December 2015, the Ukrainian team supported the last launch of the Zenit rocket with the Russian Elektro-L2 satellite from Baikonur. By all accounts, the rocket performed flawlessly. According to industry sources, at the beginning of October, Roskosmos hosted a meeting of all interested parties involved in the use of the Zenit rocket, which included Ukrainian representatives, and which resulted in the signing of a joint protocol. This preliminary agreement still needs political approval in both Russia and Ukraine, but if it goes ahead, it could see a Russian order for as many as 12 Zenit rockets. By November 2016, engineers at KB Yuzhnoe had already begun work on the integration of the Angosat satellite with the Zenit rocket in anticipation of a launch contract, whose draft was also in the works, industry sources said. Apparently, in an effort to simplify political decisions on the matter, the S7 company (with good connections in the Kremlin) served as the main customer for the launch, with all other participants, including Ukrainian contractors, under its legal umbrella. Still, the agreement on such a mission looked almost unthinkable just a few months ago. By December 2016, the KB Yuzhnoe design bureau in Dnepropetrovsk, Ukraine, began full-scale preparations for the launch of the Angosat satellite, which was officially set for July 15, 2017. On Feb. 20, 2017, the S7 airline announced that it had obtained a license for space activities in Russia. The document gave the S7 airline a permission to operate the Zenit-M rocket, whose launch was planned during 2017, the company said. 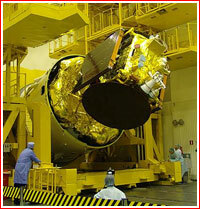 However, at the same time, industry sources told RussianSpaceWeb.com that all the work on adapting the only completed Zenit rocket for the launch of the Angosat satellite had to stop due to lack of necessary permissions from Moscow. The management of the S7 airline sent a letter to KB Yuzhnoe in Dnepropetrovsk, Ukraine, promising to resolve political problems and resume preparations for the mission as soon as the approval from the Kremlin is secured. However, the delay in the work would likely require to postpone the launch of the Angosat satellite previously scheduled for July 15, 2017, until September of the same year. The Russian-Ukrainian cooperation on the Angosat mission coincided with another flareup of violence in the border regions between the two former Soviet republics. The political problems between Russia and Ukraine also stalled plans at Roskosmos to order the production of three new Zenit rockets in Ukraine, industry sources said. By the end of April 2017, Ukrainian engineers were to begin work on the routine servicing of the Zenit rocket intended for the Angosat mission in Baikonur. At the same time, Russian and Ukrainian officials finally reached an agreement on technical cooperation in planning the launch of Angosat-1 in September of the same year. 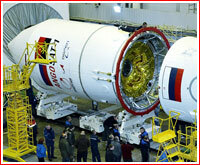 By that time, KB Yuzhnoe finalized the flight scenario, which would enable Moscow-based NPTs AP development center to model it on its simulation facility two or three months prior to launch and then program it into the flight control system of the Zenit rocket and its Fregat-SB upper stage. 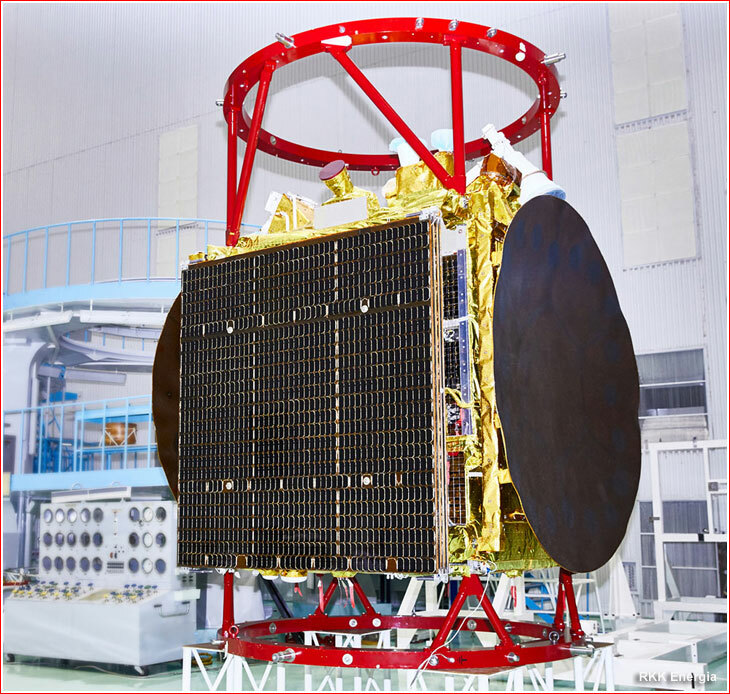 On Aug. 10, 2017, RKK Energia announced that thermal and vacuum testing of the Angosat satellite inside the the VK600/300 facility at NITs RKP center in Peresvet had been successfully completed. According to the company, all modes of operation for the satellite's service systems and communications payload were tested, including various contingencies. Representatives from Angola oversaw the operations. 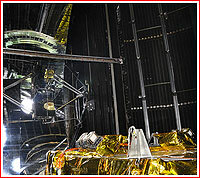 The test chamber simulated deep vacuum, solar radiation and reflected radiation of the Earth, as well as changing position of the satellite in space, RKK Energia said. Upon completion of tests, the spacecraft was delivered back to RKK Energia's campus in Korolev in preparation for final acceptance tests. By the end of August, KB Yuzhnoe received all the necessary permissions from the government in Kiev to participate in the Angosat project. The company immediately made plans to send a team of its specialists to Baikonur to service the Zenit launcher for the mission and keep the necessary personnel at the launch site to support the Angosat campaign. As of the end of August, the launch of Angosat was planned between Dec. 7 and Dec. 9, 2017, with the December 14-16 period as a backup window. On Nov. 10, 2017, RKK Energia announced that it had completed the delivery and rollout testing of the Angosat satellite and the spacecraft had been made ready for shipment to the Baikonur launch site. During the testing, RKK Energia demonstrated to the customer that the satellite's functional parameters had fully matched required specifications, the company said. According to RKK Energia, Angolan officials signed the documents confirming the completion of the necessary work and testing and the readiness of the spacecraft for transportation, RKK Energia said. The company's press-release confirmed that the launch of Angosat had been scheduled for Dec. 7, 2017. A traditional meeting of the Chief Designers' Council dedicated to the Angosat mission took place at RKK Energia on Nov. 14, 2017. According to the company, First Deputy Designer General Igor Frolov reported on the status of the project and described the innovations that had allowed to develop a relatively powerful spacecraft with a mass of just 1,647 kilograms. The satellite used Russian-built components featuring the 7-kilowatt communications payload with a power-supply specifications of 28, 50 and 100 volts, RKK Energia said. 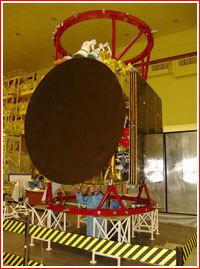 Like all other unmanned spacecraft built by the company, Angosat was equipped with electric engines which could be used to insert the spacecraft into its final operational orbit (when necessary) and conduct orbit corrections, Frolov was quoted as saying. Frolov also said that a virtual reality facility had been used for the first time during the development of the satellite. 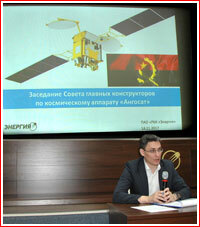 In the meantime, Igor Brodsky, the Head of the Center for Onboard and Ground Radio Complexes, reported on the readiness of the ground control complex, NKU, for the Angosat project in Russia and in Angola. The Chief Designers Council meeting formally approved the shipment of the Angosat-1 satellite to Baikonur and its flight testing. 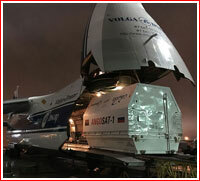 The satellite left RKK Energia's campus in Korolev during the night from Nov. 14 to Nov. 15, 2017, and was delivered to Moscow's Sheremetievo airport, where it was loaded onto the An-124-100 Ruslan transport aircraft. On November 16, the aircraft landed in Baikonur and the container with the Angosat-1 was delivered to the processing complex at Site 254, where it would be prepared for integration with the Fregat upper stage. The fueling of the Fregat was underway as of November 17. However on November 20, RKK Energia reported that although the Fregat had been loaded with propellant and pressurized gases, a technical issue associated with the operation of a valve on the stage had been discovered. It required to form an investigative commission, which included experts from Roskosmos, RKK Energia and NPO Lavochkin, which built the stage. The commission determined the cause of the problem and developed a plan for the corrective actions. According to RKK Energia, going forward, the commission would have to plan further work and determine the possibility of the launch during the primary or backup window. On November 24, RKK Energia announced that the launch of the Angosat-1 satellite had been set for Dec. 26, 2017. According to unofficial sources, it was but last day of the final launch window in 2017 which would open on December 24. 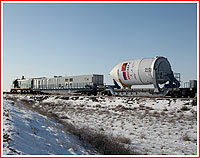 As of November 24, specialists from RKK Energia and their sub-contractors had completed checks of lithium-ion batteries on the satellite after its delivery to the launch site, completed electrical checks and final operations with the Zenit-2 launch vehicle and tested its transit electric circuits, the company said. 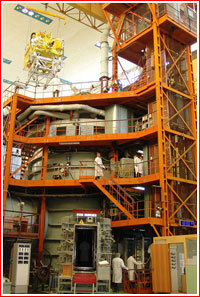 Specialists also performed work on the Fregat upper stage to fix an issue in its fuel line, RKK Energia announced. On November 28, the Soyuz-2-1b rocket failed to deliver multiple payloads into orbit after a liftoff from Vostochny spaceport. The failure investigation quickly focused on the Fregat upper stage similar but not completely identical to the Fregat-SB space tug used in the Angosat mission. It was not immediately clear whether the Soyuz failure would affect the upcoming Zenit launch. As of November 29, the launch of the Angosat satellite was still officially scheduled for December 26, but managers leading the mission were reviewing the available information on the Soyuz failure. On Dec. 16, personnel from RKK Energia, NPO Lavochkin and the Southern division of the TsENKI launch infrastructure organization completed the assembly of the payload section for the Angosat mission at the processing building at Site 31 in Baikonur, RKK Energia announced on December 18. 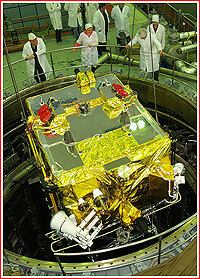 After the integration of the Angosat satellite with its Fregat-SB stage, the stack was rotated into horizontal position and covered with a payload fairing. The resulting upper composite was then transported to the vehicle assembly building at Site 42 for integration with the Zenit-2SB launch vehicle. 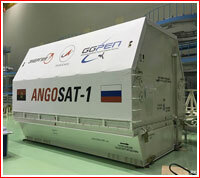 The upper composite with the Angosat satellite was integrated with the already assembled second and first stages of the Zenit rocket on December 19, 2017. Next, the personnel began electric tests of the launch vehicle, followed by its loading on the rail-based transporter-erector designed to deliver the rocket to the launch pad and install it into the vertical position. 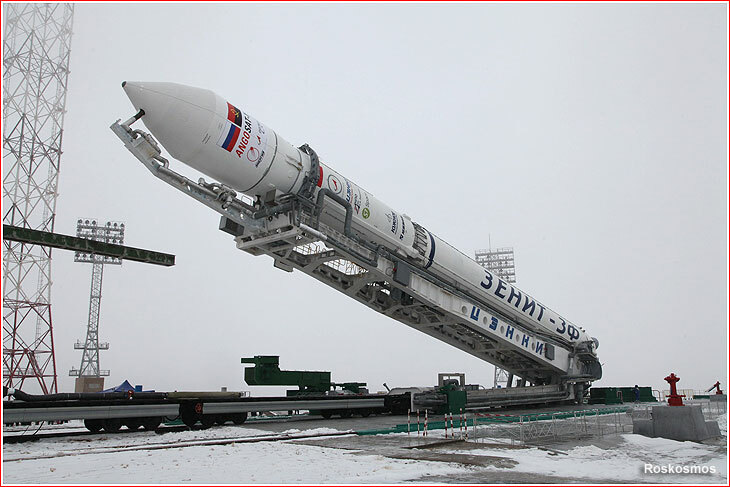 On Dec. 24, 2017, the Zenit rocket with the Angosat satellite made a 3.5-kilometer trip from the assembly building at Site 42 to the launch pad at Site 45. 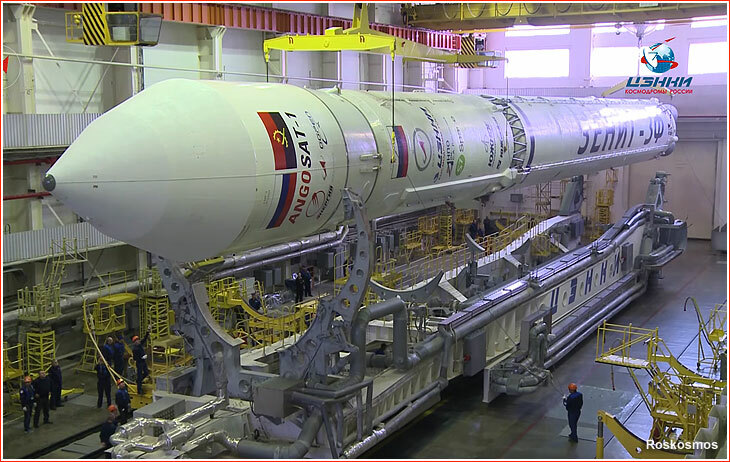 The liftoff was scheduled for Dec. 26, 2017, at 22:00 Moscow Time (19:00 GMT, 2 p.m. EST). During the initial planning of the Angosat-1 launch, specialists at RKK Energia and KB Yuzhnoe favored an early morning liftoff window for the mission. However, as the launch date drifted from July to December 2017, NPO Lavochkin, which provided the Fregat space tug for the flight, requested a shift of the liftoff time as well. During orbital maneuvers, the Fregat had certain requirements for the orientation of the X axis in its coordinate system toward the Sun and the simultaneous requirement to keep its antenna pointed toward Earth. The solar orientation depended on the time of the launch and became less favorable in case of a morning launch in December. To avoid adjusting the flight assignment, NPO Lavochkin requested a shift of the liftoff time to a window between 17:30 and 21:12 GMT. 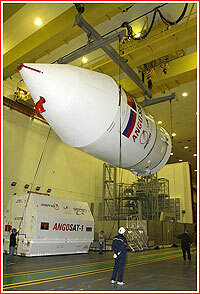 As a result, the launch was set for 19:00 GMT (22:00 Moscow Time).